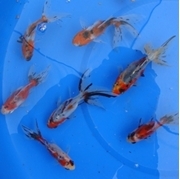 Fantail Calico Goldfish has a pearl white backing accented by beautiful red, orange & black markings. This type of goldfish is generally quite resilient and can do well in garden ponds of 180 gallons or more. 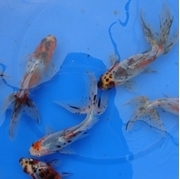 Fantail calico goldfish are a great choice for new pond owners or those who have never added fish to their water before. Fantail calico goldfish may look fancier than the average comet goldfish, but they are no more difficult to care for. These fish are ideal for backyard ponds because they can survive in cold temperatures and don't have to be constantly looked after in order to thrive. Browse our selection of fantail calico goldfish below and decide how many you want to add to your pond today! Pondliner also has a variety of other goldfish for you to choose from including fantail sarassa goldfish, shubunkin goldfish and more.